Jump into Summer in Columbia! All of the pools in Columbia are now open for the season! Go swimming. Don’t forget sunscreen. Get Active at the ARC! If you indulged a little too much over the holidays or if you’re just feeling cooped up in the cold weather during your visit to Columbia, make your way to the Activity and Recreation Center (ARC) for some sweating or swimming to break up the winter monotony. The ARC in Columbia, Missouri. This 73,000 square foot facility features two levels of active possibilities. Features include an indoor track, large weight room, dozens of cardio machines, group classrooms, a large gym with basketball courts and an indoor water park. 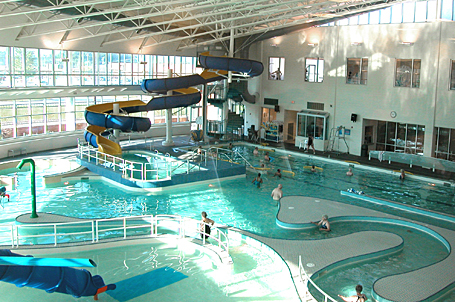 The indoor pool area is home to a lazy river, swirly water slide and an in-water playground for little ones. It’s a great escape from the winter temperatures and the perfect place to get over your cabin fever. Ready to work up a sweat? If getting your heart rate up is on your to do list, head upstairs and hop on one of the many cardio machines at the ARC. From treadmills to ellipticals to rowing machines, get your workout in and say goodbye to those cookies you ate over the holidays! The ARC makes a wonderful winter stop while you’re in Columbia. You can pay an easy one-day fee and there’s even a family option so everyone can join in on the fun. Shake off the winter blues and head to the ARC!